In 2007, when Bimla Kumari from Bihar’s Amba Kala (north) village in Piprahi block joined the National Health Mission (NHM) as an auxiliary nurse midwife (ANMs), or village-level trained health worker, on a contract basis she was determined to make the government’s “health for all” vision a reality. But a decade later, her enthusiasm has lost steam. In December 2017, she joined the state’s 16,000 NHM workers, including staff nurses, lab assistants, operation theatre technicians, pharmacists, radiographers and other peripheral health workers, who staged a week-long strike, bringing the health machinery to a halt. Her demand was regularisation of job and salary at par with the government workforce. “Just like state cadre ANMs, I ensure primary healthcare to all the 8,000 families in my village. Every day, I walk on foot to the houses of pregnant women to ensure their well-being, counsel people on family planning and conduct routine immunisation, apart from a host of other activities, such as providing first-aid care,” she says. “But I get a meagre Rs 12,500 a month, while ANMs on government service receive Rs 40,000,” adds Kumari, who could not celebrate the New Year’s day with her family as she had to accompany an expectant mother to the hospital at the block headquarters. “Besides, I have not received salary for the past five months,” says an aggrieved Kumari. While Kumari and other NHM workers withdrew the strike after the state government assured that a committee would be formed to look into their demands, not many are hopeful, and for a reason. 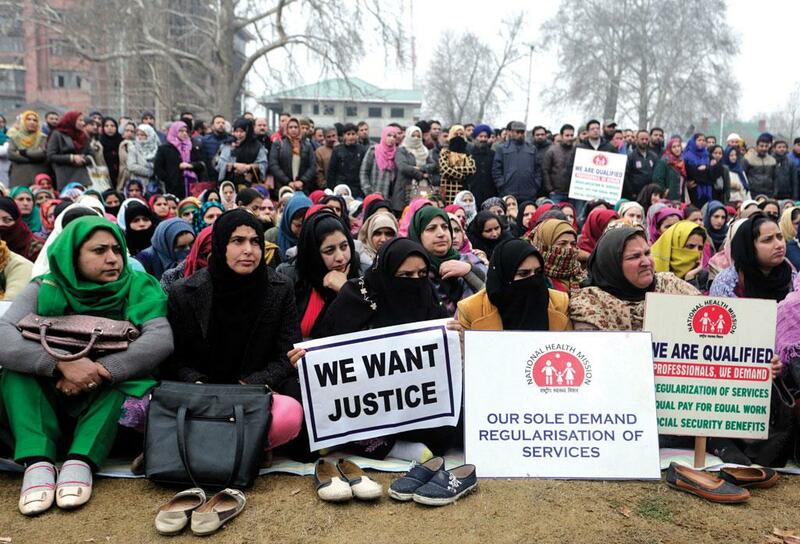 Earlier in March, the Jammu and Kashmir government had put forth such an assurance to get the striking NHM workers back to work. “The government did constitute a committee, which conceded with our demands for job regularisation and hike in salary. But its recommendations are yet to be implemented,” says Altaf Bhat, vice president of Kashmir division of J&K National Health Employees Association, adding that the 9,000 health workers have resumed strike since December 20. “We won’t go back to work until the government assures us in writing a 50 per cent hike in salary until regularisation,” adds Bhat. [The strike was on till the magazine went to print] The rage is not confined to the two sta tes. Protests by NHM workers have been reported from at least 15 states since 2015; NHM workers of several other states plan to hit the streets over the next few months. “If contract teachers can be regularised why can’t we be?” asks Hari Raj, executive secretary of NHM workers’ association of Haryana that staged a 10 day-long protest in December. “Besides, the Supreme Court has said that equal pay for equal work principle would hold true for all temporary employees and they can claim wages at par with regularly engaged government employees holding the same post,” he adds. Odisha NHM workers who plan to go on a strike soon have submitted a list of demands to the government. “It includes giving preference to NHM workers during recruitment of state staff, provision of career progression and a three-year contract instead of the current 11-month one,” says Dhanehwar Swain, general secretary of the state’s NHM workers association. Public health experts acknowledge the role NHM health workers play in delivering care at the grassroots level. Though there is no consolidated data, they say the 275,000 NHM workers form a major chunk in the government’s health machinery. Dilip Singh Mairembam, public health expert who has worked with various UN organisations, says NHM workers have made immensely important contributions in improving critical health indicators of India. A paper by health economist Sukumar Vellakkal and published in the February 2017 issue of Health Policy and Planning states: “India’s National Rural Health Mission (NRHM), one of the largest public health programmes in the world launched in 2005, increased the uptake of institutional delivery and antenatal services, particularly among the poorest socioeconomic groups.” Experts also say NHM workers, particularly ANMs, have been instrumental in encouraging expectant mothers to avail benefits of Janani Suraksha Yojana (JSY). This has not only bettered institutional delivery rates but also had multi-factoral effects. Financial assistance from JSY led to an increase in immunisation rates, post-partum check-up rates and healthy early breastfeeding practices, says a paper by Natalie Carvalho, research fellow at the Melbourne School of Population and Global Health, published in the October 2014 issue of the Public Library of Science. “We do agree that they must be regularised but then it is up to the states to absorb them in their cadre. The Union ministry has advised the state governments to do so,” says a senior research consultant with the National Systems of Health Resource Centre’s Human Resources for Health Team, a technical support body of the Union health ministry for NHM. Amit Sengupta, associate global coordinator of People’s Health Movement, India, says frequent strikes by NHM workers show that they are now a demoralised workforce. “Small wonder, the Comptroller and Auditor General of India reported last year that over Rs 4,000 crore was left unspent under NRHM funds. A demoralised workforce would lead to more attrition and performance below par,” he adds. Union Health ministry’s Rural Health Statistics 2017 show that there are 2,061 positions vacant for radiographers, 4,582 for pharmacists, 5,753 for lab technicians and 11,288 for nurses across the country. A demotivated NHM workforce would only exacerbate the situation and delay achieving the vision of NHM.